This place/object may also be State heritage listed. Check with the Victorian Heritage Database. For further details, contact the local council or go to Planning Schemes Online. The Hodgkinson Map of 1858 shows the timber church which was constructed on this site in that year. The present brick church was built in 1886; it is described in the 1887 Rate Books as the Wesleyan Church and School. In 1902, the various branches of Methodism united, and in 1903, the Collingwood Methodist Mission was established with its headquarters in the Gipps Street Church. It was one of six Methodist Missions created in inner Melbourne; the Sackville Street church was one of three churches operated by the Collingwood Mission. 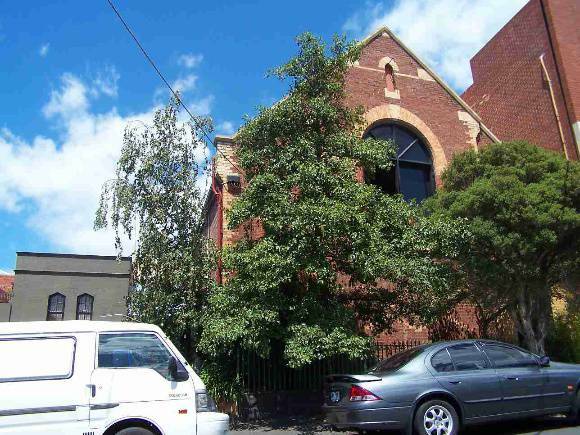 The other two churches, in Elizabeth Street, North Richmond, and in Gipps Street, have been demolished. The Mission operated until approximately 1930. The building is now used as offices, and has been extended to the east. The former Methodist Mission Church, 25-27 Sackville Street, Collingwood, is a simple brick church building with Gothic Revival details. Its walls are of face red brick, with cream brick quoining and dressings to openings. The building is rectangular in plan, and has a longitudinally gabled roof, clad in corrugated iron. The north elevation, to Sackville Street has a slightly projecting central section with a central semi-circular arched window. To the west of the window is another, smaller projecting gabled section with a pointed arched opening, presumably the original entrance. The side elevations have relatively simple lancet arched openings. The windows have chamfered bluestone sills. The former Methodist Mission Church, 25-27 Sackville Street, Collingwood, is of local historical and architectural significance. It is the only surviving building associated with the former Collingwood Methodist Mission, a key area of Protestant activity in inner Melbourne in the 19th and early 20th centuries. Architecturally, the building is a simple 19th century ecclesiastical building, designed by prominent architects Terry & Oakden, which contrasts with much of the later building stock in the street. Breakfronted bi-chromatic brick former church with brown body bricks and cream dressings and with entrance off Sackville Street. The main north facing window is round arched and flanked by narrow lancet openings, the nave walls being undecorated with lancet windows. At the rear the former mission hall with "scissors" trusses is intact.